Available NOW! This card set is designed to help you or someone you know to wait well. Use them in your home, on a desk, or to give away to a person who needs some encouragement. All of us wait. The question is HOW are we going to wait? 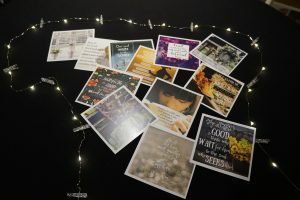 BUT NOT ONLY DO YOU GET THE CARD SET — with TWELVE beautifully created originals bursting with encouragement — YOU GET THE LIGHT SET, TOO! 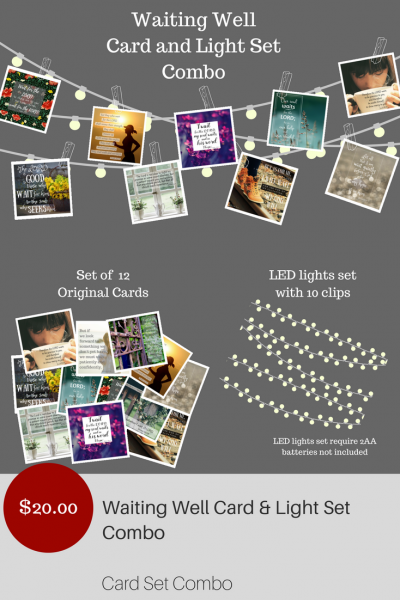 These are LED bulbs that are extremely versatile! Hang them almost anywhere because they are battery-operated (2 AA batteries not included). What a SUPER-CUTE addition to an already awesome set! We think you or someone you know will love it! Twelve original 4.75 by 4.75 matte card stock cards with verses from Scripture that speak to our seasons of waiting. One set of LED string of lights with clips. These are clear lights that are battery operated. Two AA batteries not included. 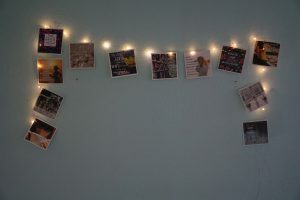 As you can see, these are perfect for a bedroom, over a bulletin board or the dorm room as the perfect gift for a college student! They are easily attached or removed. Give them away as a set or individually. These cards work perfectly for memorizing Scripture.